Christopher and Michael become multi-millionaires and their greed endangers Katherine's life. While Christopher, Michael and Thomas are racing to rescue her, Robert Cain's army steals the mysterious machine and his frightening intentions become clear. Can Michael beat his inner demons? Will Katherine lose the will to survive? In this exciting sequel to Brothers, Bullies and Bad Guys the future becomes clear, and it seems things can only get worse. 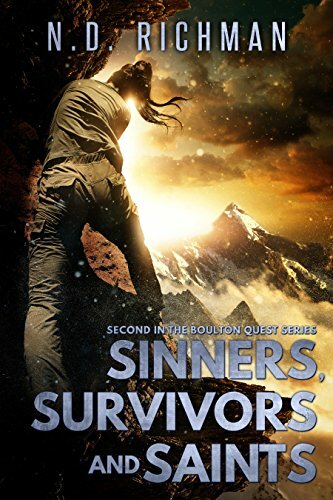 Sinners, Survivors, and Saints is book two of the Boulton Quest Series. Chris and Michael are back again. This time, they're saving a friend who's put into danger as a result of the brothers' actions.